Okay so Nepal has not been kind to us, we have spent almost all of our time here so far being bathroom bound, not able to eat a full meal and exhausted from climbing stairs - not ideal when we have plans to trek to Everest Base Camp. It’s hard to not feel disheartened when you’re fighting a losing battle with your body and home comforts seem a million miles away, but we’re keeping in high spirits. We’re having to take it slow and wait for our bodies to regain strength, but it’s beginning to take its toll on us. It’s such bad luck that we’ve been so unwell on this trip, even when taking every precaution to stay away from disease - but it could be so much worse and we’re trying to not take this part of our travels for granted. 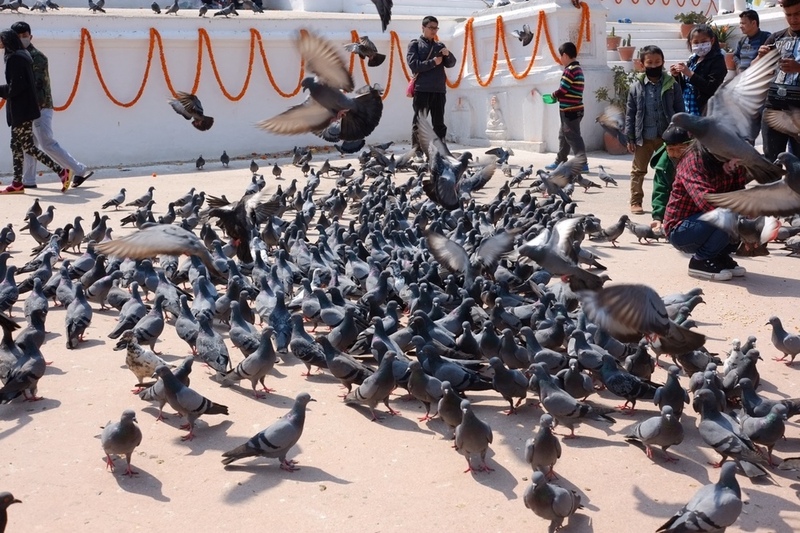 These photographs were taken on another day in which we were determined to get out and about: the sanitation of the country combined with the sheer amount of pigeons and rubbish in the streets doesn’t exactly boggle the mind as to why there is so much disease around.